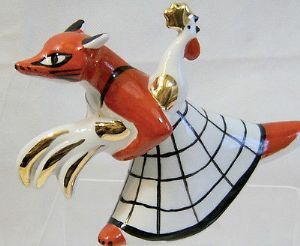 This exceptionally well-produced medium-sized figurine from one of the best facrories in The Russian Federation, Verbilky, has created a charming take on one of the old Nursery Rhymes of days long ago, 'The Fox & The Cockerel' . As I recall, the Cockerel comes out the winner, so Christmas Dinner is not for the not-so-wily old fox! It measures 6.5 inches (16.5 cms) in length and 5.5 inches (14 cms) in height. The figurine is immaculate. It is appropriately backstamped but has no box. I'm happy to provide further photos of individual figurines if required. Artware Collectables is pleased to be able to offer some of the products from the Verbilky Porcelain Facory; coming along shortly will be their beautiful and very well respected Chess Set, the pieces of which are loosely based on earlier Russian military figures. Expect for the price to be around GBP (£)400.00. There will be only a few available due to the problems created by Putin's invasion of East Ukraine followed by Sanctions enforced by the West but we shall do out utmost to secure sufficient Sets to fulfil the basic order requirements.